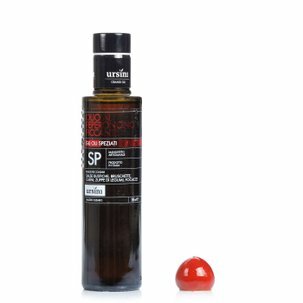 The la Gricia sauce is part of Ursini's special sauces made without tomato. La Gricia is based on the recipe of the Amatriciana sauce: Ursini makes it using aged pork cheek, an optimal Pecorino DOP, white onion, a handful of spices and extra virgin olive oil produced in house. 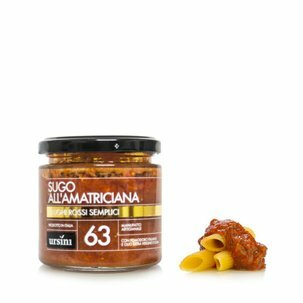 Here is a light-coloured, intense sauce with an unmistakable aroma and the full flavour of tradition. Try it on a plate of al dente pasta, perhaps rigatoni: you can also complete the dish with a light dusting of pepper if you wish. 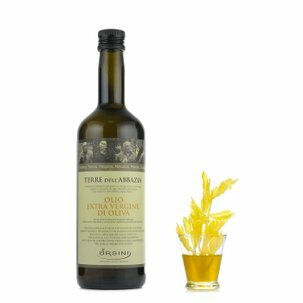 Ingredients Onion 51%, extra virgin olive oil 19%, aged pork cheek (pork, salt, natural flavourings. Antioxidant: ascorbic acid. Preservatives: sodium nitrite and potassium nitrate) 15.5%, Pecorino (sheep's milk, salt, rennet) 13.8%, white wine (contains sulphites), For more information on product labels, please contact our Customer Service department. The information on the labels of the products may vary for reasons beyond our control, therefore, there may be discrepancies between the information on the site and that on the products delivered. Please always check the information on the product before consumption or use. For the Ursini family, the fundamental rule is their attention to the ingredients. This is why they select healthy olives, ripened to the right point, harvested by hand and ground the same day for the oil and ripe vegetables processed within a few hours of harvesting to make their vegetable conserves: sauces, creams, delicacies. New and delicious recipes, in the continuous search for perfection to delight the most attentive consumers.